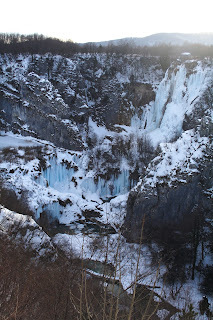 A few days before I visited the Plitvice, it snowed heavily and the road to the Plitvice from Zagreb was closed due to very strong wind. But, fortunately, when I travelled there, the temperature increased to 5 degrees. So, the condition was good - the Plitvice in snow, but relatively warm temperature. Before I got there, I thought there would be few people, because of heavy snow in the past few weeks. But, I was wrong! There were many people already. 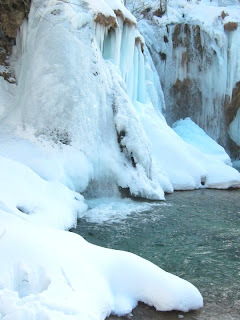 The Plitvice in snow was amazingly beautiful. It looks completely different from summer. In summer, people enjoy walking around the lakes, which has very unique emerald green colour, and spray of waterfalls and the sound of the waterfalls. 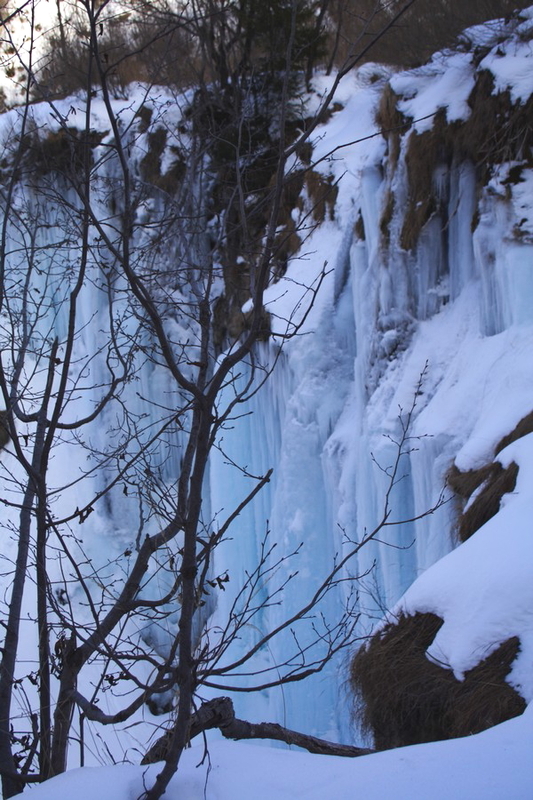 In winter, most of the lakes and waterfalls are frozen. Although, the water still flows while making dynamic sounds. 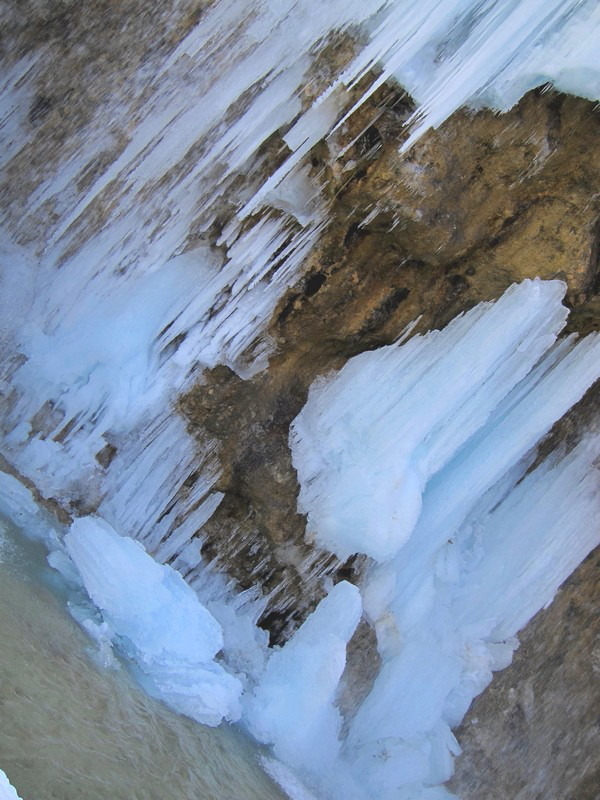 As you will find on the photos, I saw many interesting "nature art". 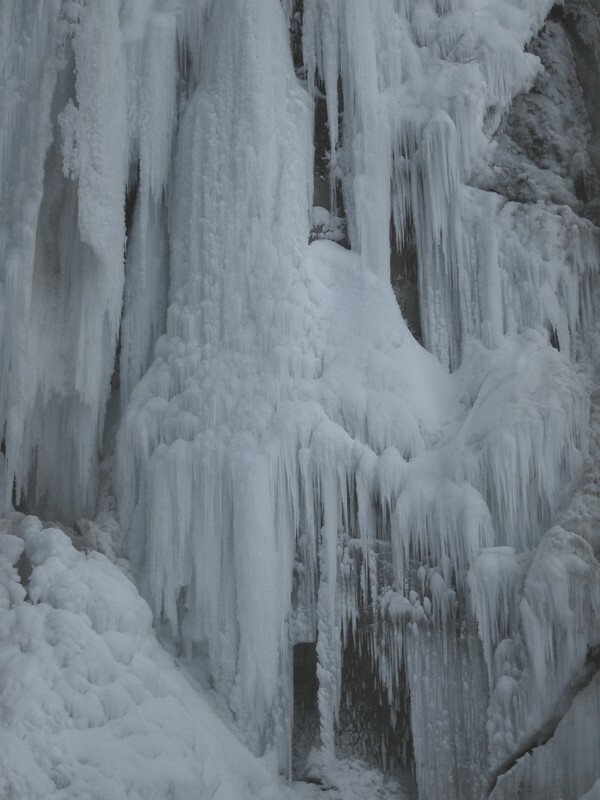 The spray of the waterfall made an ice domes, and through which water still flows. Other waterfall made ice curtains. 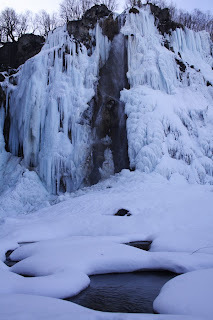 I even found an ice mushroom near the big waterfall! Walking in the Plitivice in snow was actually very hard. Most of the passages were not completely cleaned. So, sometimes I had no choice but to slip on my bum to go down the steps, because the snow had half-melted and became icy... 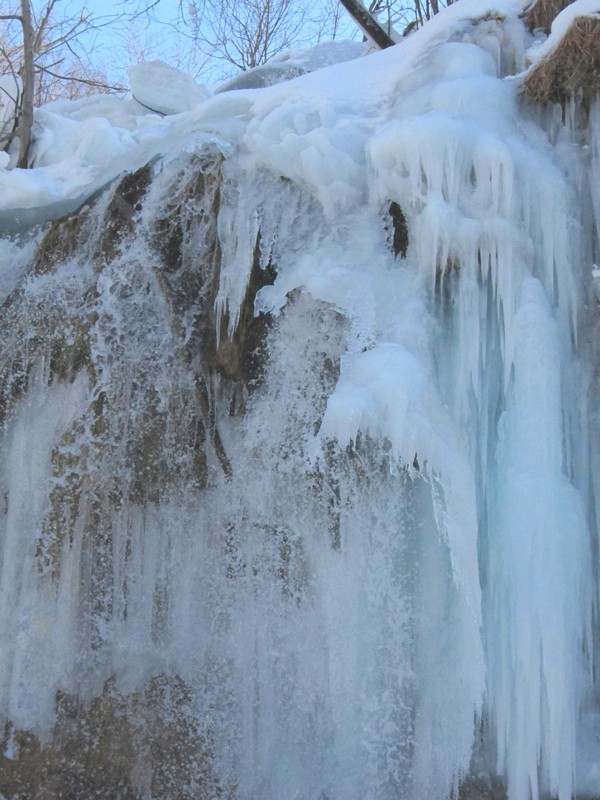 So, when you visit the Plitvice in winter, please be extra careful to walk. 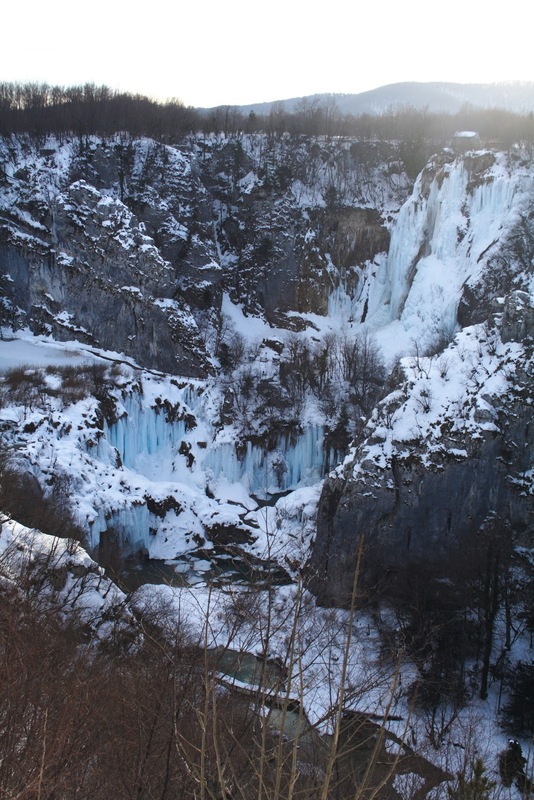 But, because the most of the passage was covered by the snow and the shallow lake under the big waterfall, which is the main attraction of the Plitvice, I could walk very closer to the big waterfall, almost under it, which is not possible for summer! Looking up the big waterfall was amazing. By the way, the Plitvice has 2 entrances. 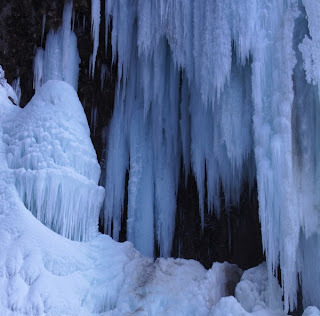 However, during the winter, I would recommend to use the main entrance. Because, I was told at the second entrance that the passages had not been cleaned and I wouldn't be able to go further. Also, boats to transfer people to the upper lakes were not on service, because the lake is frozen. So, technically, you can only walk around the big waterfall and around in winter. Because of these reasons, the entrance ticket to the Plitvice was discounted to half price (40Kn)!Hmmm, maybe you still think it's expensive, considering that passages are not cleaned, though... Also, the ticket office is opened until 15:00 in winter. So, if you get there after the opening hour, you can entre free. 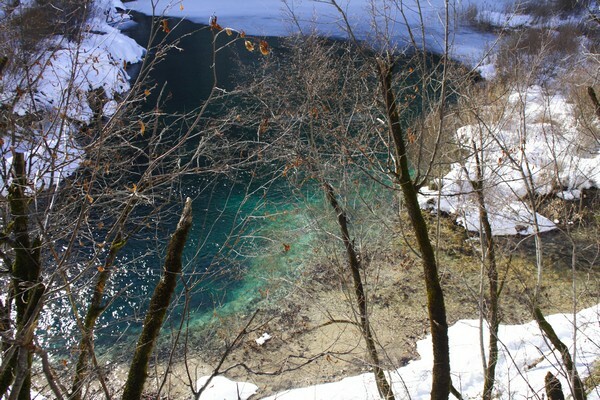 But, be careful, the Plitvice in winter gets dark very quickly!